It’s time to get on Hank's Marketing Soapbox: this time it has to do with the use of Stock photography instead of actual photos of you, your team, and your workplace. Stock photography can be useful, when used correctly. Sometimes you find yourself on deadline and NEED a photograph which tells the story you want to tell. If you don’t have the time to create and take the photo yourself or have your photographer provide you with a shot, there are many sites which can provide you with a perfect image. And when you have the choice between no image and stock photography, then I would always say to use a photograph. But when stock photography is used inappropriately, it can muddle your marketing message. In this article, I want to give you several examples of how stock photography was used well, and when it could have been easily replaced. I will do it by sharing the websites of a few friends and clients who have used stock photography and those who have not. You will easily see the difference when you look at the photos we have included and visit their sites. The most common use, or misuse, of stock photography is ‘industry background’ photos. That’s when you are in a particular profession and you use a photo that shows people who are theoretically in your profession. The second most common use are scenic photographs of a geographic area. The second example is from one of our new clients, Freedman Crossett Financial Services. One of the next things we will be doing with them is updating their website, so here are the BEFORE photos. They have a slider that uses stock photos. The photos picture three of their target markets which is good. The downside is that this is a replicated site for financial planners which means that dozens of their competitors could have the same photos. 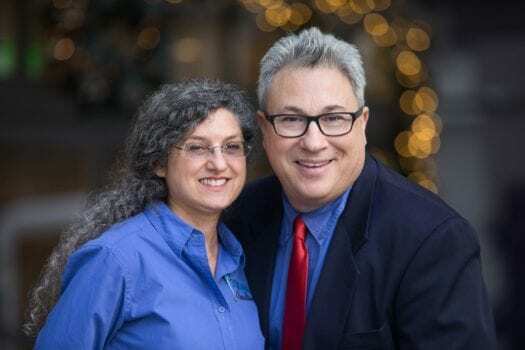 If you have heard us talk about being a “category of one” in our Small Business Marketing Plan Bootcamps, you would see that this does not help Alan Freedman and Cindy Crossett stand apart. We have suggested, and they are going to seek out, clients who would not mind being the stand in on their website. You can also see that on this cookie-cutter site, their new logo we designed for them is not pictured. Their new site will have this upgrade as well. This next example is a hybrid of stock and ‘real’ photos. When you look at the Dewey's Plumbing site, you will see a slider with two stock photos, but also within view, is a picture of Chris Spannagel, who owns the company. This situation could be fixed easily. When Chris and his crew are out on jobs, they can take photos of the projects they are working on. The more they take, the faster they will come up with photos to replace the stock photography. Another thing to do, if you have a good size crew of people, is to put a group shot in your slider. This builds morale as everyone can see they are part of your team. The downside? When people leave, you eventually have to re-shoot the photo. One of our clients, recent Pet Sitter of the Year, Heather Branch, (2014 by the National Association of Professional Petsitters) takes photos of her clients and has them rotate on the header of her website. That way you see the types of pets she and her team care for daily and you know that they are her actual pets. When she meets with potential clients, she can tell the story of each ‘family member’ she looks after. Next is a combination of stock and actual photos. One of the top Keller Williams realtors in Arizona, Kelly Preschler has used a combination of homes she has sold and ‘atmosphere’ photos which give you an idea of what it is like to live in Sedona and the type of interior design ideas she can help you with. She is trying to attract an upscale clientele and her photos speak to that. The one photo that we would suggest she replace is the sky photograph. We would substitute that one for another photograph of a home that Kelly has sold. That photo could have been taken anywhere, and it allows the viewer to ask the question “Where was that photo taken?” instead of “I wonder how fun it would be to work with Kelly to find our next home?” Kelly has a total of 5 photographs rotating on her slider. This should be the maximum number you use. If you have too many, some people want to make certain they have seen all of them and it mentally takes away from the amount of time they are willing to spend on your website. The last thing we want is for them to leave, so limit the slider time. Also, if you use a video instead of the slider, that video should be no longer than 10 seconds long. By the way, since she is a certified negotiation expert, she can see both sides of the contract for a win-win. A sixth example is from one of our clients, Bell Rock Veterinary Clinic. They had us re-design their website and you can tell from the photography that they used one photographer (Thanks, Elizabeth Gilbert Photography) to take the photos inside and outside of their clinic so they all have the “they match” feeling. Dr. Rachelle Jarvis DVM and her team are incredible and their website backs that up. All you need to think about is how wonderfully they will take care of a member of your family. Dr. Jarvis had Elizabeth Gilbert shoot lots of photographs around the clinic, and even more of her working with patients and ‘clinic cats.' That way she has a reserve of photographs to pull from when she blogs. A fantastic example of using photos the business took instead of relying on stock photography is on the Westrails Paint Works website. Their slider has 5 photos of homes they have painted with the testimonial from the homeowner superimposed on the photo. This is incredibly good marketing. Donald Masters backs up those testimonials, too. He and his team do a great job. We want to give you an example of someone who uses videos on the front of his page. Angelo LaMarco , owner of Digital Edge Video Production, uses links to videos he has shot on the front (and interior) pages of his website. There is no doubt that when you see his site that the artwork which goes with it is his. As the viewer, we are instantly familiar with his work and there is zero dissonance in our minds. Angelo has done a lot of video work for us, we enjoy working with him and think you would, too. No article about stock photography would be complete without having a discussion about copyrights. Basically: Someone who has taken the shot, owns the shot and you may not use it without their permission. Once, I had a business person tell me that since she found one of my photos on the internet it was fair game for her to use it. NO! Always ask permission. Most photographers will be OK with your using a shot if you acknowledge their photograph and copyright and provide a link back to their web page. We did that with a video we have put on our site which shows some beautiful visuals of Sedona. Here’s a Marketing tip: No matter what business you are in, you should ALWAYS have up to date (24 months or less) professional photographs of you and your staff. We were speaking at an event recently and our friend, Photographer Val Westover , was shooting for the producer of the event. We have worked with Val several times before so he knows us, and what we like. During a break, he was able to shoot us. Would you be able to tell he got this (and a ton more) great shot in a hotel parking lot? If your ‘office’ is not on a speaker’s stage like ours most often is, have the photographer come to your office or some place with an appropriate back drop and shoot your entire staff at one time. It saves time and money (fewer set up times for the photographer) and it will make the STAFF page on your website look professional. That’s because all the backdrops and lighting will be the same. Compare that to websites you have seen where they just asked everyone to provide the company with a photo. This is a place where you must NOT use a photo taken with a Smartphone in a casual setting. Even if you are dressed in your Sunday best. The trouble is, the photographer is probably more used to shooting events, and not shooting formal shots. Notice that there is are plants growing out of the three of their heads? And the glasses on the gentleman on the left are tinted? That is because his glasses naturally do that when he goes outside. Also, the setting is not very lawyer-like. When it is hard enough to find new clients and get them to ‘YES,’ let’s not plant any other thoughts in their mind. Hire a professional that is used to doing headshots and group shots. Here’s a marketing tip about headshots: If you are not a suit-and-tie kind of person, you don’t have to dress up for the head shot. Dress as you normally would, or just a level above, and go through the same process with a professional photographer. Most photographers will want to shoot you in two or three different outfits, and you can decide when you see the proofs which ones you will use. Here’s another marketing tip about headshots: As much as you can, use the same headshot for all your social media pages. It allows people to see your photo as a ‘logo’ that is familiar to them when they are looking for you. Getting proper photographs is not always easy. We know that. We are upgrading our OWN website and are continually on the prowl for great shots of us speaking on stage and working with clients. Remembering that having photos is better than not having photos, always be anxious to upgrade your shots. You will be very glad you did. Connect with us at Info@YuloffCreative.com or call us at 800-705-4265. You can even get a free marketing assessment, where we can talk about the photographs you use by heading to FreeMarketingConsulation.com.